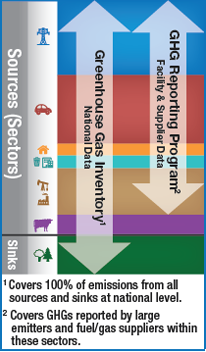 EPA tracks U.S. greenhouse gas emissions and their sources through two complementary programs: the Inventory of U.S. Greenhouse Gas Emissions and Sinks (the Inventory), and the Greenhouse Gas Reporting Program (GHGRP). While the two programs cover emissions from many of the same sources, they are not identical in their coverage, categorization, or methodologies. The table below highlights some of the key distinctions between the Inventory and the GHGRP. Learn more about the differences and similarities between the Inventory and the GHGRP. You can use FLIGHT and Data Explorer in tandem to research the answers to your GHG questions. Want to see which sector has contributed the most GHG emissions nationally since 1990? Find out by looking at the long-term trends in Data Explorer, then go to FLIGHT to find the facilities contributing the most GHG emissions in your state or metro area. However, the programs differ in how some sectors are defined. The Inventory includes emissions from the agriculture sector and data regarding forestry GHG sinks, while the GHGRP does not.